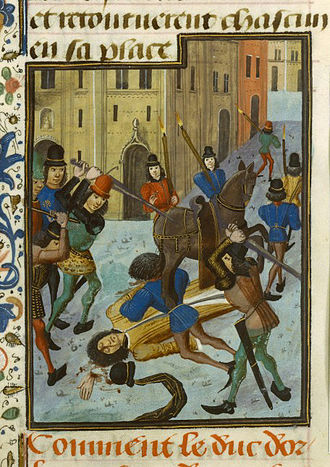 The execution of Hugh the younger Despenser, a miniature from one of the better-known manuscripts of the Chronicles. Froissart's Chronicles (or Chroniques) are a prose history of the Hundred Years' War written in the 14th century by Jean Froissart. 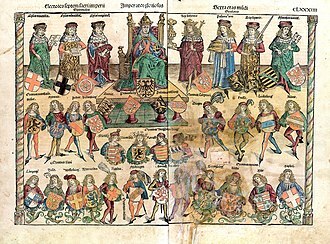 The Chronicles open with the events leading up to the deposition of Edward II in 1326, and cover the period up to 1400, recounting events in western Europe, mainly in England, France, Scotland, the Low Countries and the Iberian Peninsula, although at times also mentioning other countries and regions such as Italy, Germany, Ireland, the Balkans, Cyprus, Turkey and North Africa. For centuries the Chronicles have been recognized as the chief expression of the chivalric culture of 14th-century England and France. 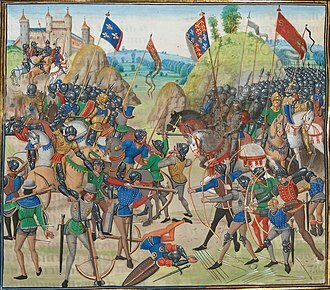 Froissart's work is perceived as being of vital importance to informed understandings of the European 14th century, particularly of the Hundred Years' War. 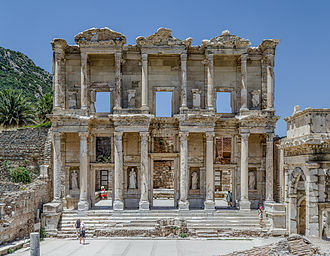 But modern historians also recognize that the Chronicles have many shortcomings as a historical source: they contain erroneous dates, have misplaced geography, give inaccurate estimations of sizes of armies and casualties of war, and may be biased in favour of the author's patrons. Although Froissart is sometimes repetitive or covers seemingly insignificant subjects, his battle descriptions are lively and engaging. 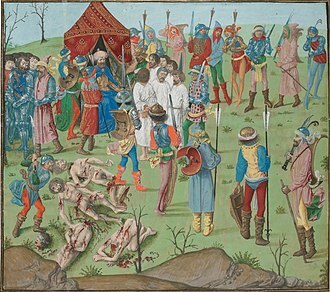 For the earlier periods Froissart based his work on other existing chronicles, but his own experiences, combined with those of interviewed witnesses, supply much of the detail of the later books. 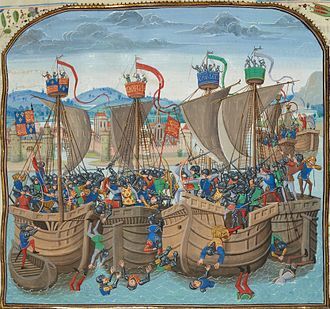 Although Froissart may never have been in a battle, he visited Sluys in 1386 to see the preparations for an invasion of England. He was present at other significant events such as the baptism of Richard II in Bordeaux in 1367, the coronation of King Charles V of France in Rheims in 1380, the marriage of Duke John of Berry and Jeanne of Boulogne in Riom and the joyous entry of the French queen Isabeau of Bavaria in Paris, both in 1389. Sir Walter Scott once remarked that Froissart had "marvellous little sympathy" for the "villain churls." It is true that Froissart often omits to talk about the common people, but that is largely the consequence of his stated aim to write not a general chronicle but a history of the chivalric exploits that took place during the wars between France and England. Nevertheless, Froissart was not indifferent to the wars' effects on the rest of society. His Book II focuses extensively on popular revolts in different parts of western Europe (France, England and Flanders) and in this part of the Chronicles the author often demonstrates good understanding of the factors that influenced local economies and their effect on society at large; he also seems to have a lot of sympathy in particular for the plight of the poorer strata of the urban populations of Flanders. The Chronicles are a very extensive work: with their almost 1.5 million words, they are amongst the longest works written in French prose in the late Middle Ages. Few modern complete editions have been published, but the text was printed from the late 15th century onwards. Enguerrand de Monstrelet continued the Chronicles to 1440, while Jean de Wavrin incorporated large parts of it in his own work. Robert Gaguin's Compendium super origine et gestis Francorum made ample use of Froissart. In the 15th and 16th centuries the Chronicles were translated into Dutch, English, Latin, Spanish, Italian and Danish. The text of Froissart's Chronicles is preserved in more than 150 manuscripts, many of which are illustrated, some extensively. Jean Froissart came from Valenciennes in the County of Hainaut, situated in the western tip of the Holy Roman Empire, bordering France (it is now in France). He seems to have come from what we would today call a middle-class background, but spent much of his adult life in courts, and took on the world-view of the late medieval feudal aristocracy, who initially represented his readership. He appears to have gained his living as a writer, and was a notable French poet in his day. 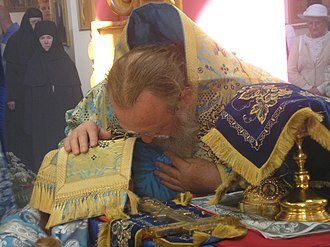 At least by the end of his life he had taken holy orders, and received a profitable benefice. 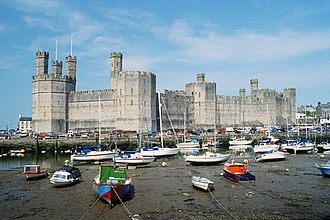 He first wrote a rhyming chronicle for the English queen Philippa of Hainault, which he offered to her in 1361 or 1362. The text of this earliest historical work, which Froissart himself mentioned in the prologue of his Chronicles, is usually considered to have been completely lost, but some scholars have argued that a 14th-century manuscript containing a rhyming chronicle, of which fragments are now kept in libraries in Paris and Berlin, may be identified as this so-called 'lost chronicle'. Chroniques de Froissart Battle of Beverhoutsveld. Froissart began writing Book I possibly at the request of Robert de Namur, to whom the earliest version was dedicated. 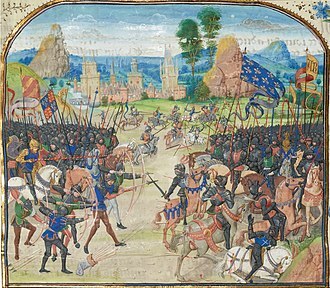 In the prologue of this version of the prose text, Froissart justified his new enterprise by his desire to improve on his first attempts to write a historical account of the early years of the Hundred Years' War. In particular he denounced his earlier rhyming chronicle, whose accuracy, he admitted, had not always been as good as such important matters as war and knightly prowess require. In order to improve the quality and historical accuracy of his work, Froissart declared his intention to follow now as his main source the Vrayes Chroniques of Jean Le Bel, who had expressed fierce criticism on verse as a suitable vehicle for serious history writing. Froissart also used other texts, such as the Life of the Black Prince by Chandos Herald, in particular for the Black Prince's campaign in Spain in 1366-1367. 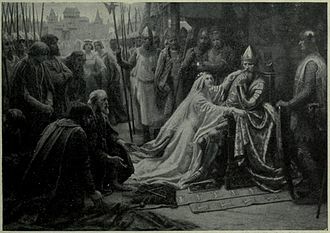 He furthermore inserted some official documents into his text, including the act of hommage by King Edward III to the French King Philip VI (1331) and the English version of the Peace Treaty of Calais (1360). Le Bel had written his chronicle for Jean, lord of Beaumont, uncle of Philippa of Hainault, who had been a supporter of Queen Isabella and the rebellion which led to the deposition of Edward II in 1326. Jean of Hainault had also taken part in several of the early battles of the Hundred Years' War, first on the English side, then on the French. His grandson, Guy II, Count of Blois later became the main patron of Froissart's Chronicles. 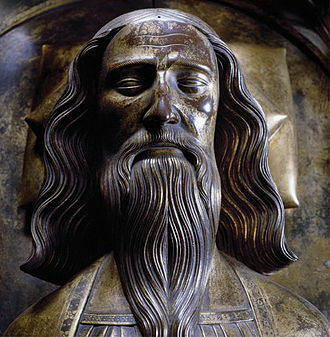 Jean Le Bel himself, throughout his work expressed great admiration for Edward III, in whose 1327 Weardale campaign against the Scots he had fought. 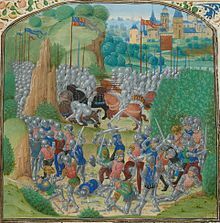 For all these reasons Froissart must have highly valued Le Bel's chronicle as a source for reliable information about the events which led to the outbreak of the war between France and England and about the early phases of the Hundred Years' War. Comparison of Froissart's Book I with Le Bel's work shows that for the early parts of the Chronicles (up to c.1360) Froissart often directly copied and developed very large parts of Le Bel's text. Froissart seems to have written new drafts of Book I, which covers the period up to 1378/1379, at different points in time. Several of these variant versions are now known to scholars by the unique manuscripts which have transmitted their texts, such as the 'Amiens' (Amiens, Bibliothèque municipale, ms. 486), 'Valenciennes' (Valenciennes, Bibliothèque municipale, ms. 638), and 'Rome' versions of Book I, so named after manuscripts kept in the municipal libraries of Amiens and Valenciennes and in the Vatican Library. The so-called 'Rome' version of Book I (Vatican City, Biblioteca Apostolica Vaticana, Reg. Lat. 869) has only partly survived and now only covers the period up to c.1350. The order of the authorial versions of Book I has been discussed extensively by scholars in the last century and a half and there have been many fundamental disagreements. French scholars have often followed Siméon Luce, the French 19th-century editor of the Chronicles, who thought that the 'Amiens' version was a more recent version that must have followed the 'A' and 'B' versions in the chronology. But research by Godfried Croenen has now firmly established that these earlier views are no longer tenable. Croenen has demonstrated that the so-called 'A' version that Luce had identified, is in fact a hybrid version composed by medieval scribes who put together the very beginning and end of the authorial 'A' version, combining it with a much larger part of the so-called 'B' version, and a fragment of the Grandes Chroniques de France covering the years 1350-1356. The authorial 'A' version, which is now largely lost except for the fragments from the beginning and end, is the first version of Book I written by Froissart and was probably composed by him between June and December 1381. The 'Amiens' and 'Valenciennes' versions are both earlier than the so-called 'B' redaction. The 'Amiens' version and the abridgement of Book I (Paris, BnF, fr. 10144) were probably both written in the period 1384-1391, but the 'Amiens' version seems the earlier of the two. The 'B' redaction is the version of Book I that was edited by S. Luce for the Société d'Histoire de France and that represents what is often seen as the 'standard' version of Book I. Luce himself was convinced that the 'B' version represented the earliest completed state of Book I and that it was therefore earlier than the 'Amiens' text. The evidence from the text, however, argues strongly for a date of composition in or shortly after 1391, so certainly later than the 'Amiens' version, and before 1399. The 'B' version was followed by the 'C' version of Book I, written sometime between 1395 and 1399, which was long considered lost; the 'C' version actually survives in a single manuscript now in the Newberry Library in Chicago. The 'Rome' version was written towards the end of Froissart's life, at the earliest in late 1404 and probably sometime before 1415. 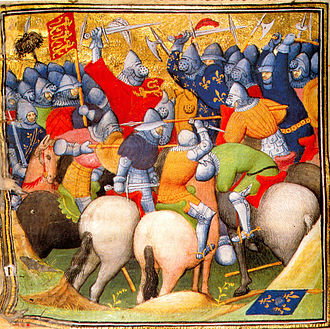 Battle of Neville's Cross, 1346, from the Gruuthuse manuscript. A first version of the second book of Froissart's Chronicles, which in the author's mind never seems to have been a separate book but rather a continuation covering the period 1378-1385, was probably completed in the late 1380s. It does not seem to have been based on other pre-existing chronicles and is therefore entirely Froissart's own work. 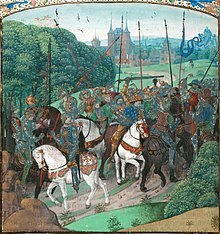 Book II, however, includes an extended account of the Flemish revolt against the count in the years 1379-1385, which Froissart had earlier composed as a separate text and which is known as his Chronicle of Flanders. Froissart inserted several official documents into his Chronicle of Flanders, which were also kept in Book II of the Chronicles, including the text of Treaty of Tournai (1385) that re-established peace between the Flemish cities and their count. As with Book I, Froissart also seems to have rewritten the later books of his Chronicles. Apart from the Chronicle of Flanders, at least three authorial versions of Book II survive. Most manuscripts of Book II contain one of the two earlier versions, which have an almost identical text, except for a small number of chapters in which there are substantial differences. 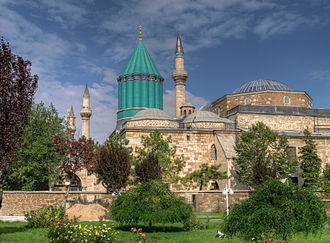 The manuscripts of these two earlier versions have provided the basis for all the modern editions. There is also a later version of Book II, which dates from after 1395 and survives only in the Newberry manuscript that also contains the 'C' version of Book I. The Newberry version of Book II is substantially different from the other known versions and is undoubtedly the result of an extensive authorial reworking of the text, which included the addition of important material that does not appear in the other versions. The Newberry text has not yet been fully edited but it has been partly transcribed for the Online Froissart. A first version of Book III, which covers the years 1385 to 1390, but which also includes extensive flashback to the earlier periods, was possibly completed in 1390 or 1391 and is the one found in nearly all the surviving manuscripts. A second version exists in a single manuscript (Paris, Bibliothèque nationale de France, MS fr. 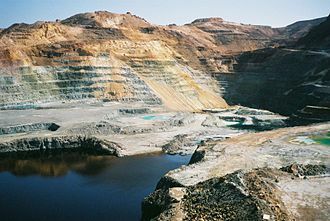 2650). This second version is probably a later reworking by Froissart himself: it follows the pattern that can be seen in the different authorial versions of Book II, with many chapters remaining the same and some chapters having been extensively rewritten. Book IV, whose text goes up to the year 1400, remains incomplete and was probably, like the 'Rome' version of Book I, written after 1404. It is likely that the abrupt ending of Book IV is to be explained by Froissart's death, which may have occurred while he was writing this part of the Chronicles. Book IV has been transmitted in 21 manuscripts, all representing a single authorial version. The text shows traces of having been worked over by a 'copy editor', who was not the author but someone who seems to have prepared a text, possibly autograph, for reproduction. Unlike the other three books of the Chronicles, Book IV seems to have remained unknown for a long time, until it was discovered in the second half of the 15th century, when the first manuscript copies of the text were made and the text started to circulate in the court circles of the Dukes of Burgundy. The Chronicles were almost immediately popular among the nobility, and many manuscripts were expensively illuminated. In the first quarter of the 15th century many illustrated copies of Book I, as well as some copies of Books II and III, were produced by the Parisian booktrade. Nearly half of these surviving copies can be linked to a particular libraire, called Pierre de Liffol. Several artistic hands can be detected in these copies, but two anonymous miniature painters seem to stand out as regular collaborators in Liffol's production: the Boethius Master and the Giac Master. There was something of a revival in interest from about 1470 in the Burgundian Low Countries, and some of the most extensive cycles of Flemish illumination were produced to illustrate Froissart's Chronicles. Several complete copies of the four books, as well as all the illustrated manuscripts of Book IV, date from this period. Whereas older illustrations are mostly rather simple and formulaic, with decorated backgrounds, the larger images of this later period are often full of detail, and have extensive views of landscape, interiors or cities in their backgrounds. Most of the images here come from this period. One of the most lavishly illuminated copies was commissioned by Louis of Gruuthuse, a Flemish nobleman, in the 1470s. The four volumes of this copy (BnF, Fr 2643-6) contain 110 miniatures painted by some of the best Brugeois artists of the day. Among them is Loiset Lyédet, who has been identified as the painter who executed the miniatures in the first two volumes. Those in the third and fourth volume have been attributed to a collaboration between the Master of Anthony of Burgundy, the Master of the Dresden Prayer Book and the Master of Margaret of York. Many of the illustrations to this entry come from this copy. ^ Sir Walter Scott: Tales of my landlord. As used here, "villain" means "villein". ^ Peter Ainsworth, 'Froissardian perspectives on late-fourteenth-century society', in Jeffrey Denton and Brian Pullan (eds. ), Orders and Hierarchies in Late Medieval and Renaissance Europe (Basingstoke / London: Macmillan Press, 1999), pp. 56-73. ^ Croenen, Godfried. "Online Froissart". HRIOnline. Retrieved 26 December 2013. 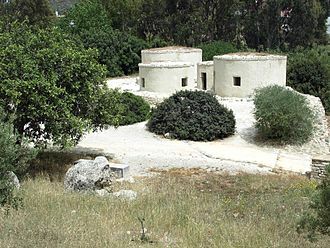 ^ Franck Collart, Un historien au travail à la fin du XVe siècle: Robert Gaguin (Geneva: Droz, 1996), 121-122, 341-344. ^ Godfried Croenen, 'Froissart illustration cycles', in Graeme Dunphy (ed. ), The Encyclopedia of the Medieval Chronicle (Leiden: Brill, 2010), I, 645-650. ^ Normand R. Cartier, 'The lost chronicle', Speculum 36 (1961), 424-434; Peter F. Ainsworth, Jean Froissart and the Fabric of History: Truth, Myth, and Fiction in the Chroniques (Oxford: Clarendon Press, 1990), pp. 32-50; Jean Devaux, 'From the court of Hainault to the court of England: the example of Jean Froissart', in Christopher Allmand (ed. ), War, Government and Power in Late Medieval France (Liverpool: Liverpool UP, 2000), pp. 1-20. ^ Dominique Stutzmann, 'Un deuxième fragment du poème historique de Froissart', Bibliothèque de l'Ecole des Chartes, 164 (2006), 573-580. ^ Jean-Marie Moeglin, 'Froissart, le métier d'historien et l'invention de la Guerre de Cent Ans', Romania 124 (2006), 429-470. ^ J.J.N. Palmer, 'Book I (1325-78) and its sources', in J.J.N. Palmer (ed. ), Froissart: Historian (Woodbridge: Boydell Press, 1981), pp. 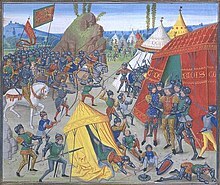 7-24; Peter F. Ainsworth, 'Collationnement, montage et jeu parti: le début de la campagne espagnole du Prince Noir (1366-67) dans les Chroniques de Jean Froissart, Le Moyen Âge, 100 (1994), 369-411. ^ J.J.N. Palmer, 'Book I (1325-78) and its sources', in J.J.N. Palmer (ed. ), Froissart: Historian (Woodbridge: Boydell Press, 1981), 7-24; P. Courroux, L'écriture de l'histoire dans les chroniques françaises (XIIe-XVe siècle) (Paris: Classiques Garnier, 2016), 352-361. ^ Godfried Croenen, 'La Guerre en Normandie au XIVe siècle et le problème de l'évolution textuelle des Chroniques de Jean Froissart', in A. Curry and V. Gazeau (eds. ), La Guerre en Normandie (XIe-XVe siècle) (Caen: Presses Universitaires de Caen, 2018), 111-147, table p. 127. 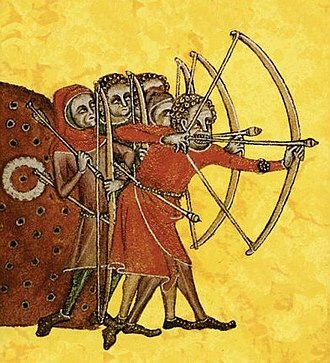 ^ Croenen, 'La Guerre en Normandie', p. 118-122, 127. ^ George T. Diller (ed. ), Froissart. Chroniques. Livre I. Le manuscrit d'Amiens. Bibliothèque municipale n° 486, 5 vols. (Geneva: Droz, 1991-1998); Michael Schwarze, Generische Wahrheit - Höfischers Polylog im Werk Jean Froissarts (Wiesbaden: Franz Steiner, 2003), p. 209; Jean-Marie Moeglin, 'Froissart, le métier d'historien et l'invention de la Guerre de Cent Ans', Romania 124 (2006), 429-470. ^ G. Croenen, Jean Froissart, Chronicles [Amiens version and abridged version], in M. Livingston and K. DeVries (eds.) The Battle of Crécy: A Casebook (Liverpool: Liverpool University Press, 2015), p. 396-397, 400-402; Croenen, 'La Guerre en Normandie', p. 126-127. ^ Siméon Luce (ed. ), Chroniques de J. Froissart [Book I] 8 vols. (Paris: Société de l'histoire de France, 1869-1888). ^ G. Croenen, Jean Froissart, Chronicles [B/C version], in M. Livingston and K. DeVries (eds.) The Battle of Crécy: A Casebook (Liverpool: Liverpool University Press, 2015), p. 407-410; Croenen, 'La Guerre en Normandie', p. 126-127. ^ Godfried Croenen, 'A 'refound' manuscript of Froissart revisited: Newberry MS f.37', French Studies Bulletin, 31 (2010), 56-60; G. Croenen, Jean Froissart, Chronicles [B/C version], in M. Livingston and K. DeVries (eds.) The Battle of Crécy: A Casebook (Liverpool: Liverpool University Press, 2015), p. 407-410; Croenen, 'La Guerre en Normandie', p. 126-127. ^ George T. Diller, 'La dernière rédaction du premier livre des Chroniques de Froissart. Une étude du Reg. lat. 869', Le Moyen Âge, 76 (1970), 91-125; Croenen, 'La Guerre en Normandie', p. 126-128. ^ Peter Ainsworth, 'Froissart and his Second Book', In: Christopher Allmand (ed. ), War, Government and Power in Late Medieval France (Liverpool: Liverpool University Press, 2000), pp. 21-36. ^ Godfried Croenen, 'A 'refound' manuscript of Froissart revisited: Newberry MS f.37', French Studies Bulletin, 31 (2010), 56-60. 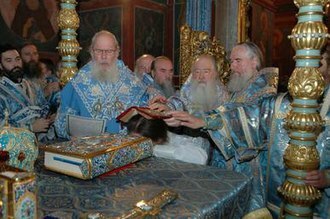 ^ Godfried Croenen, 'La tradition manuscrite du Troisième Livre des Chroniques de Froissart', in Valérie Fasseur (ed. ), Froissart à la cour de Béarn: l'écrivain, les arts et le pouvoir (Turnhout: Brepols, 2009), pp. 15-59. ^ Godfried Croenen, 'Stemmata, philology and textual history: a response to Alberto Varvaro', Medioevo Romanzo, 34 (2010), 398-402. ^ Alberto Varvaro, 'Problèmes philologiques du Livre IV des Chronique de Jean Froissart', in Godfried Croenen & Peter Ainsworth (eds. ), Patrons, Authors and Workshops: Books and Book Production in Paris around 1400 (Leuven: Peeters, 2006), pp. 255-277. ^ Alberto Varvaro, La tragédie de l'histoire. La dernière œuvre de Jean Froissart (Paris: Classiques Garnier, 2011). ^ Godfried Croenen, Mary Rouse & Richard Rouse, 'Pierre de Liffol and the manuscripts of Froissart’s Chronicles, Viator 33 (2002), 261-293; 'Les Chroniques de Jean Froissart', Art de l’enluminure, 31 (2009). ^ Laetitia Le Guay, Les princes de Bourgogne lecteurs de Froissart. Les rapports entre le texte et l'image dans les manuscrits enluminés du livre IV des Chroniques (Turnhout: Brepols, 1998). ^ Ilona Hans-Collas & Pascal Schandel, Manuscrits enluminés des anciens Pays-Bas méridionaux. 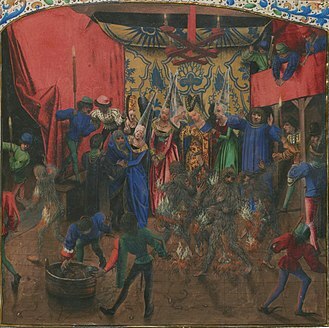 I. Manuscrits de Louis de Bruges (Paris: Bibliothèque nationale de France, 2009), pp. 272-283. Wikimedia Commons has media related to Jean Froissart. Jehan de Waurin, lord of Le Forestier was a Burgundian soldier, politician and compiler, a bibliophile. He belonged to a family of Artois, and witnessed the battle of Agincourt from the French side. As a historian he put together the first chronicle intended as a history of England, very extensive but largely undigested. Written in French, in its second version it extends from 688 to 1471, strictly his subject is Great Britain, but essentially only England is covered, with a good deal on French and Burgundian events as well. He was illegitimate, the son of Robert de Waurin, Lord of Wavrin, which is now in France on the Belgian border and his father was hereditary seneschal of Flanders and conseiller-chambellan of the Duke of Burgundy. 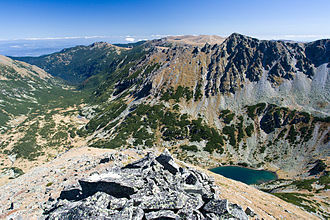 Wavrin was legitimated in 1437 by Philip the Good and knighted five years later. He fought for the Burgundians at the battle of Verneuil and elsewhere, Jehan compiled the Recueil des croniques et anchiennes istories de la Grant Bretaigne, a collection of the sources of English history from the earliest times to 1471. For centuries, Froissarts Chronicles have been recognised as the chief expression of the chivalric revival of the 14th century Kingdom of England and Kingdom of France. His history is an important source for the first half of the Hundred Years War, what little is known of Froissarts life comes mainly from his historical writings and from archival sources which mention him in the service of aristocrats or receiving gifts from them. 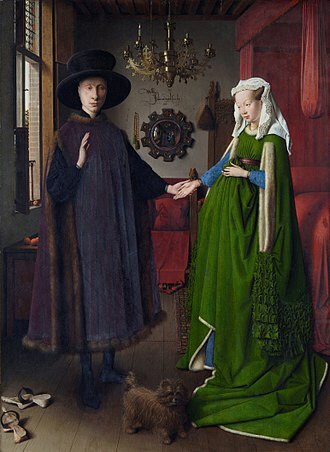 This is why de Looze has characterised these works as pseudo-autobiographical, Froissart came from Valenciennes in the County of Hainaut, situated in the western tip of the Holy Roman Empire, bordering France. Earlier scholars have suggested that his father was a painter of armorial bearings, other suggestions include that he began working as a merchant but soon gave that up to become a cleric. For this conclusion there is no real evidence, as the poems which have been cited to support these interpretations are not really autobiographical. By about age 24, Froissart left Hainault and entered the service of Philippa of Hainault, queen consort of Edward III of England, in 1361 or 1362. This service, which would have lasted until the death in 1369, has often been presented as including a position of court poet and/or official historiographer. Froissart took an approach to his work. He traveled in England, Wales, France and Spain gathering material and he traveled with Lionel, Duke of Clarence, to Milan to attend and chronicle the dukes wedding to Violante, the daughter of Galeazzo Visconti. 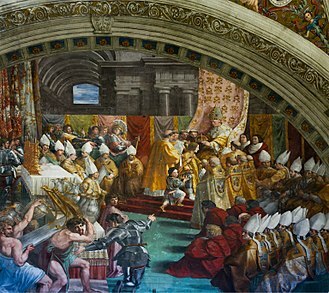 At this wedding, two other significant writers of the Middle Ages were present and Petrarch, after the death of Queen Philippa, he enjoyed the patronage of Joanna, Duchess of Brabant among various others. He received rewards—including the benefice of Estinnes, a village near Binche and became canon of Chimay—sufficient to finance further travels and he returned to England in 1395 but seemed disappointed by changes that he viewed as the end of chivalry. The date and circumstances of his death are unknown but St. Monegunda of Chimay might be the resting place for his remains. Much more than his poetry, Froissarts fame is due to his Chronicles, the text of his Chronicles is preserved in more than 100 illuminated manuscripts, illustrated by a variety of miniaturists. Valenciennes is a commune in the Nord department in northern France. It lies on the Scheldt river, although the city and region experienced a steady population decline between 1975 and 1990, it has since rebounded. 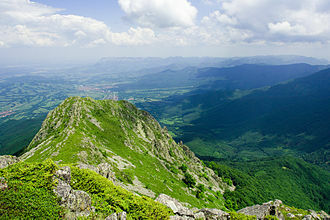 The 1999 census recorded that the population of the commune of Valenciennes was 41,278, Valenciennes is first mentioned in 693 in a legal document written by Clovis II. In the 843 Treaty of Verdun, it was made a city between Neustria and the Austrasia. Later in the 9th century the region was overrun by the Normans, in 923 it passed to the Duchy of Lower Lotharingia dependent on the Holy Roman Empire. Once the Empire of the Franks was established, the city began to develop, under the Ottonian emperors, Valenciennes became the centre of marches on the border of the Empire. In 1008, a famine brought the Plague. 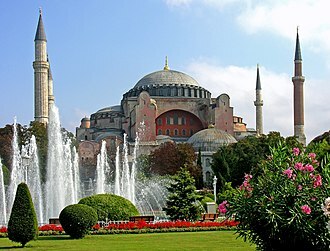 According to the tradition, the Virgin Mary held a cordon around the city which. Since then, every year at that time, the Valenciennois used to walk around the 14 kilometres road round the town, many Counts succeeded, first as Margraves of Valenciennes and from 1070 as counts of Hainaut. In 1285, the currency of Hainaut was replaced by the currency of France, Valenciennes was full of activity, with numerous corporations, and outside its walls a large number of convents developed, like that of the Dominicans. In the 14th century, the Tower of Dodenne was built by Albert of Bavaria, where even today, in the 15th century, the County of Hainault, of which Valenciennes is part, was re-attached to Burgundy, losing its autonomy. 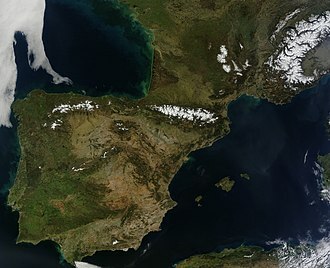 On the Journée des Mals Brûlés in 1562, a mob freed some Protestants condemned to die at the stake, in the wave of iconoclastic attacks called the Beeldenstorm that swept the Low Countries in the summer of 1566, the city was the furthest south to see an attack. 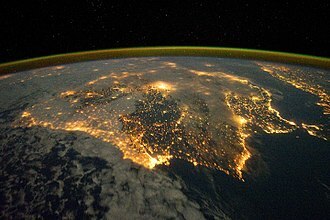 In 1576, when for a time the Southern Netherlands joined the revolt, however, in 1580, Alexander Farnese, Duke of Parma took Valenciennes and Protestantism was eradicated there. Hereafter, Valenciennes remained under Spanish protection, no longer involved in fighting of the Eighty Years War. With its manufacturers of wool and fine linens, the city was able to economically independent. 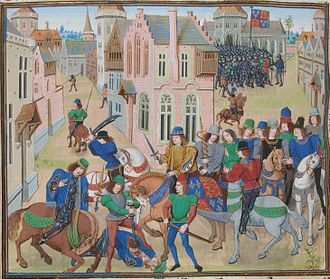 The Peasants Revolt, called Wat Tylers Rebellion or the Great Rising, was a major uprising across large parts of England in 1381. The final trigger for the revolt was the intervention of an official, John Bampton. His attempts to collect unpaid taxes in Brentwood ended in a violent confrontation. A wide spectrum of society, including many local artisans and village officials, rose up in protest, burning court records. The rebels sought a reduction in taxation, an end to the system of unfree labour known as serfdom, inspired by the sermons of the radical cleric John Ball, and led by Wat Tyler, a contingent of Kentish rebels advanced on London. They were met at Blackheath by representatives of the royal government, King Richard II, aged 14, retreated to the safety of the Tower of London, but most of the royal forces were abroad or in northern England. The following day, Richard met the rebels at Mile End and acceded to most of their demands, rebels entered the Tower of London, killing the Lord Chancellor and the Lord High Treasurer, whom they found inside. On 15 June, Richard left the city to meet with Tyler, violence broke out, and Richards party killed Tyler. Richard defused the situation long enough for Londons mayor, William Walworth, to gather a militia from the city. Richard immediately began to order in London and rescinded his previous grants to the rebels. The revolt had spread into East Anglia, where the University of Cambridge was attacked. Unrest continued until the intervention of Henry le Despenser, who defeated an army at the Battle of North Walsham on 25 or 26 June. Troubles extended north to York and Scarborough, and as far west as Bridgwater in Somerset, Richard mobilised 4,000 soldiers to restore order. Most of the leaders were tracked down and executed, by November. 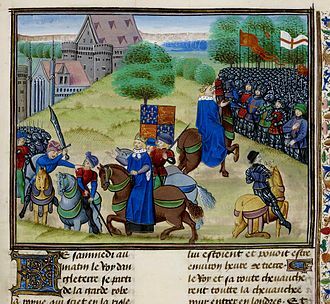 The Peasants Revolt has been studied by academics. Interpretations of the revolt have shifted over the years and it was once seen as a defining moment in English history, but modern academics are less certain of its impact on subsequent social and economic history. John, Duke of Berry was the owner of the Fonthill vase, made in Jingdezhen, China, the earliest piece of Chinese porcelain documented to reach Europe, in 1338. 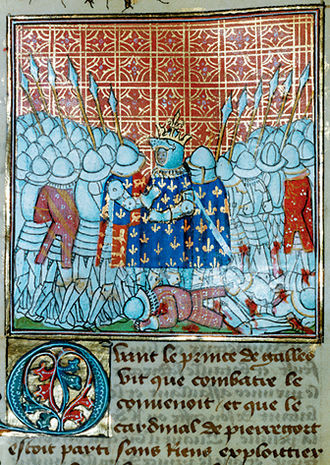 In his first bout of illness, Charles VI attacked his knights in 1392, shown in a miniature from Froissart's Chronicles. 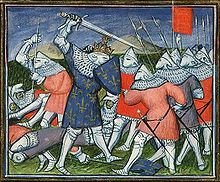 John the Fearless ordered the assassination of Isabeau's political ally Louis of Orléans in 1407, depicted in a 15th-century miniature. 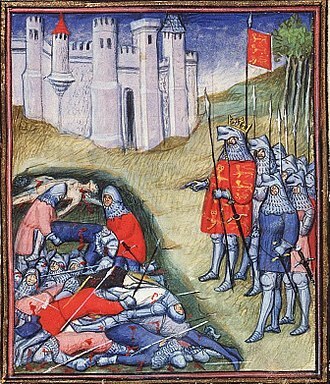 Roger Mortimer and Queen Isabella, illustration from the chronicle of Jean de Wavrin.